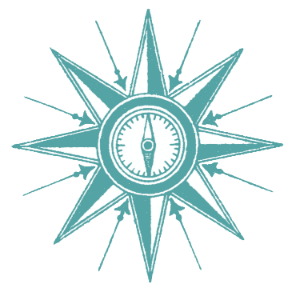 Vision 20/20 is the Chamber’s strategic plan aimed at positioning our members, and the county, for success. Our Vision is rooted in the core values of accountability, service, growth, and engagement. 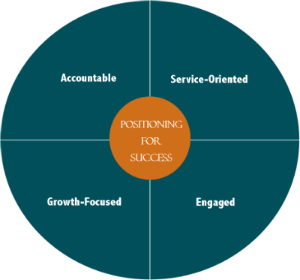 These values form the foundation and set the bar for our four areas of focus. They were established and are characterized by wisdom, prudence, and good judgement and serve as our compass as we forge new paths to success. Our mission is to provide businesses with the resources, services, and advocacy for economic growth through active community engagement. Our Vision grew from this mission and helps us identify important projects on which to focus in order to grow our business community and create value for our members. We are committed to accomplishing our mission in a spirit of collaboration and a tenacious drive for innovative solutions. 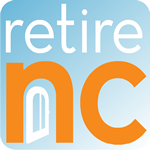 The collaboration among local governments, educational institutions, community organizations, and the Chamber has been the catalyst for positive change in Mcdowell County. 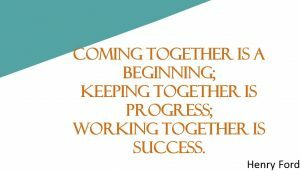 The Chamber understands the value of these relationships and how open communication and community partnerships can create opportunity for everyone moving forward. Click on the different tabs to explore our programs within each area of focus. An integral part of its mission, community development has been a core focus area since the Chamber’s inception in 1957. Through the years, the organization has either supported, sponsored, or launched several impactful projects and programs in the community. 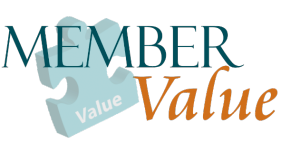 When choosing projects for Chamber involvement, we are guided by our core values, accountability, service, growth, and engagement. Municipal Event Center—The Chamber spearheaded this project with an initial $125K donation and will continue as lessee along with the City of Marion for a 10-year period. The 15,000-square-foot space will allow for events of all types from concerts to weddings. Broadband Expansion—This ongoing project will extend high-speed internet service to remote and rural areas of McDowell County for students, residents, and businesses. The goal is to provide coverage for 80% of the county. McDowell Economic Development Association—MEDA was founded in 1982 as the McDowell Committee of 100. This initiative is thriving today and focuses on business recruitment and expansion. McDowell Business & Industry Center—A successful business incubator located on the campus of McDowell Technical Community College. Working with the college and area business, the Chamber facilitated the center, which now operates as the Small Business Center. Lake James State Park—Understanding the economic impact this project would have on our members and the benefit to our community, the Chamber worked closely with Burke County Chamber of Commerce and legislators to bring this beautiful facility to fruition. Marion Correctional Institution—A strong recruitment initiative launched in 1990 and led by the Chamber and the County Commission resulted in the opening of the facility in 1995. Today the MCI provides more than 400 well-paying jobs. McDowell Chamber Visitor Center—The Chamber conducted a four-year capital campaign raising funds to construct the Visitor Center along US 221 corridor. The Center welcomes more than 15,000 visitors a year sharing information on our businesses and our community. LINC & CARP—Linc and Carp serve as our community leadership programs that introduce adults (Linc) and middle-school students (Carp) to the bevy of opportunities and growth-projects within our county. These courses highlight local career pathways and opportunities to our students while educating our residents on the important sectors that define local economic, civic, and public life. Free Marketing Tools —Through the Chamber’s member management software, every member has access to free marketing tools including a community calendar, a job posting tool, a press release tool, and a hot deals tool to reach the more than 400k website visitors and 100k plus social media audience—at no extra charge! Visitor Center—This beautiful Center is the heart of the Chamber and allows us to represent our community and members with local art and crafts, member brochures, and information to the more than 15K visitors that come through the doors annually. The Visitor Center is the result of a four-year capital campaign and provides a beautiful meeting space for members and the community. B2B Networking—The Chamber supports and promotes several free networking groups for business owners including, McDowell Marketing Masterminds, McDowell Toastmasters, and McDowell Young Professionals. We also have regular Business After Hours and our Fresh Brewed Ideas morning coffee sessions. Workplace Wellness—A Chamber-led initiative involving research on the importance of wellness in the workplace that led to the creation of a full-time community workplace Wellness Advisor that assists companies and businesses with establishing and maintaining wellness programs and policies. Its success led to recognition from the state as well as the Center for Disease Control. Educational Workshops—The Chamber hosts regular business-focused workshops, panel presentations, and lectures from experts across all industries to provide free and low-cost educational opportunities to members. Shop Local Campaign—The Chamber runs an ongoing Shop Local Campaign using several different media including the Chamber website, social media channels, billboards, and newspapers. 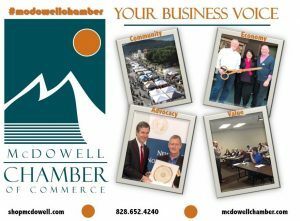 McDowell Tourism Development—Established in 1986 as a permanent, full-time program dedicated to advertising and promotions for McDowell County, it developed into its own organization working closely with the city, county and the Chamber to promote the area. Marketing Opportunities—The Chamber offers several sponsorship opportunities throughout the year for specific events and general annual options. Once a busy manufacturing town, the changing face of commerce challenged our community and we met that challenge head on! Our revitalization reveals the innovation in manufacturing and education, showcases the determined spirit of the entrepreneur, and the commitment of a community to its present and its future. Situated between the bustling mountain cities of Asheville and Hickory, local leaders recognize the growth potential of McDowell, but they also exercise great respect for the very qualities that made the area so attractive to residents, companies, and entrepreneurs. McDowell is uniquely positioned amid 67,000 acres of undisturbed forest land and the tranquil waters of Lake James—offering more than 150 square miles of dense, forested shoreline. McDowell is also home to parts of America’s first officially designated wilderness area, Linville Gorge Wilderness Area that features 11,786 acres around the Linville River. Our natural resources are one of our greatest assets and we are committed to protecting it for all to enjoy. McDowell County Visitor Center— The Chamber conducted a four-year capital campaign raising funds to construct the Visitor Center along US 221 corridor. The Center welcomes more than 15,000 visitors a year sharing information on our businesses and our community. 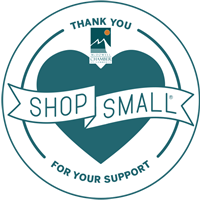 Shop Local Campaign—This ongoing marketing campaign includes advertising, promotion, networking, and consumer awareness of our local businesses. McDowell Tourism Development—Launched by the chamber in 1986, this initiative now is a permanent, full-time program dedicated to promotion and marketing of our county as a great place to live, work, and play. Mountain Glory Festival—Annual event in October that highlights the handicrafts, music, art, and other attributes of the mountain region, now run by the city of Marion. Keep McDowell Beautiful—Founded in 1984 as McDowell Clean County System, the program now operates as a community supported beautification, environmental education, recycling, and conservation effort. Broadband Expansion Project—An ongoing effort to bring more high-speed internet service to McDowell County residents, students, and existing and prospective businesses. New towers are being acquired to help obtain approximately 80% coverage of the county. Heritage Grant Program—This initiative provides financial support to local nonprofits that create and/or administer programs that enhance public understanding of and participation in the county’s cultural assets. McDowell House Preservation—The Chamber is actively involved in the preservation and restoration of the McDowell House. We at the Chamber understand that a collective voice is far more effective than a single utterance. The needs of our business community drive our work and are at the core of our mission statement. McDowell Tourism Development— On behalf of our business members, the Chamber worked with local governments to develop an organization dedicated to the promotion of our county to businesses and visitors. The MTD now operates at Blue Ridge Traveler and works together with the Chamber in that effort. Lake James State Park—Beautiful Lake James State Park, which features a swim beach, water activities, miles of hiking, biking, or running trails, was a hard-won advocacy effort by the Chamber in concert with Burke County and regional legislators that started in 1986. Along with boating, swimming and fishing in the beautiful, clear waters of the 6,812-acre lake, there are 25 miles of trails, 15 of which are open to mountain biking. Inter-Basin Transfer—The Chamber was successful in leading the opposition to an effort that would have transferred 36 million gallons of water per day from Lake James to Concord-Kannapolis area. Heritage Grant Program—This ongoing program provides financial support to local nonprofits that create and /or administer programs that enhance public understanding of and participation in the county’s cultural assets. McDowell House Preservation—The Chamber is actively involved in the preservation and restoration of the McDowell House and works to facilitate its use as a local heritage treasure and economic asset. Legislative Agenda—The Chamber works to represent its member’s interest in legislation that directly affects them. We actively support and advocate locally and regionally for business-friendly policies.